Motorcycle enthusiasts all over the world would agree that Suzuki is one of the most exciting two-wheeler brands out there. Look at their line-up that covers almost every segment. The Japanese motorcycle manufacturer recently revived the iconic Katana with a new-age design and tons of electronics without deviating away from its core. Be it the track loving GSX-R1000R or the highway munching cruiser, the Intruder M1800R, all these motorcycles have a distinct character. Surprisingly, Suzuki has also managed to pack in the characters of its bigger machines into its younger and more accessible offerings like the Gixxer and the Intruder 150 sold in India. The Suzuki Intruder 150, in particular, is an interesting offering. And there's not one but many reasons for it. Let's start with its design. If you've seen the larger Intruder, you will find a strong resemblance in the design. Unlike its rivals, the Suzuki Intruder focuses more on a premium and upmarket design that is unique and functional at the same time. The cruiser comes equipped with projector like LED position lamp, a substantially sized large front cowl, LED tail light, muscular exhaust design and flowing character lines. The instrumentation on the Suzuki Intruder 150 takes inspiration from the legendary Hayabusa and the GSX-R1000. With so much of legacy behind it, the Intruder surely stands out from the rest of the offerings. 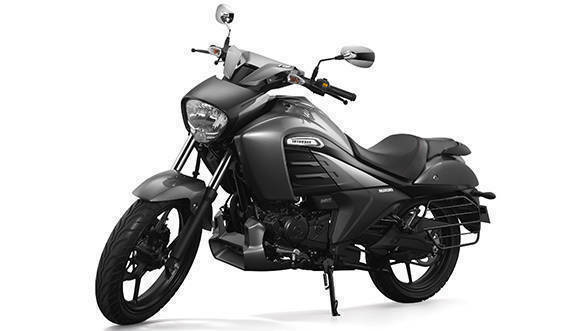 The Suzuki Intruder 150 uses the same 155cc engine that does duty so well in the Gixxer. It was, in fact, the combination of enthusiastic performance, excellent refinement and good economy that elevated the Suzuki Gixxer to the top of OVERDRIVE's 150cc commuter motorcycle table. And that's the engine the Suzuki Intruder 150 gets. Peak power and torque are identical at 14.8PS at 8,000rpm and 14Nm at 6,000rpm. Based on a robust and a proven platform, the rear monoshock also gets a seven-step adjustable preload. All those numbers start making sense once you start riding the Suzuki Intruder 150. Yes, it is a cruiser but that does not make it any difficult to ride in city traffic. Once can easily ride through traffic and the smooth engine, light clutch and the softer suspension setup makes it extremely convenient. 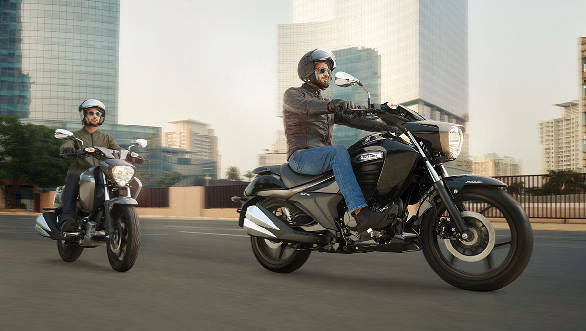 However, if you really wish to enjoy the full potential of the Suzuki Intruder 150, take it on the highway. It is here that the Intruder 150 lives up to its full potential. The linear power delivery and the relaxed riding position makes even long journeys an enjoyable experience.